PLEASE NOTE: The Baader T-2 90-deg Correct Image Amici Prism Diagonal consists of a diagonal body with prism only. 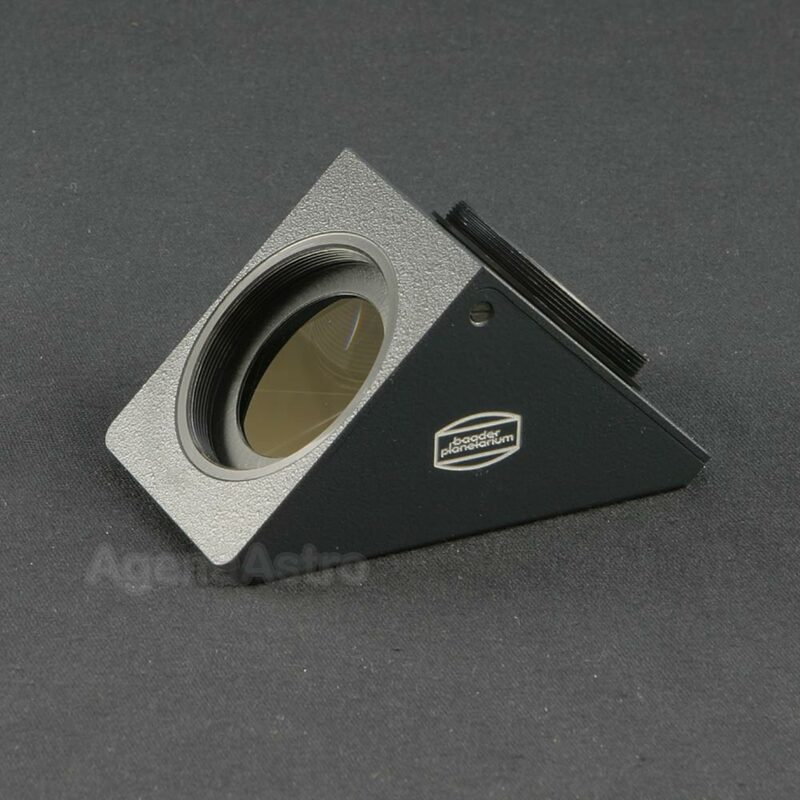 It is provided as a basic component, without any nosepiece or eyepiece holder. It incorporates standard T-2 threads at the input (female T thread on the telescope side) and output (male T thread on the eyepiece side) faces. This permits the diagonal to be used as a compatible component along with the other Baader Planetarium T-2 adapters and accessories. This also enables you to configure the diagonal to exactly suit your needs, and to fit 2" or 1.25" eyepieces, and focusers. The Amici Prism has long been favored as the best choice for producing correctly oriented images in refractors and cassegrain type telescopes. However, the production of an amici prism is complex and requires a much higher level of quality than a standard mirror or right angle prism diagonal. Prism faces must be polished smooth, flat, and very accurately located at the proper positions and angles. The sharp roof edge must be made vanishingly fine. These demands on prism quality are the prime reason why even expensive amici prism diagonals have developed a deserved reputation for poor image quality. Even the so-called premium quality amici prisms typically produce astigmatic or asymetrical images and display a bright prominent central diffraction spike (the roof edge diffraction spike in the Baader Amici is extremely faint). Also, making matters worse, undersized prisms are used to save cost and large housings give the false illusion of a large clear aperture (as is the case with most so-called 2" amici star diagonals available today). Baader Planetarium produces what might well be the finest amici prism star diagonal available today. The prism has been made to the proper specifications, in order to provide image quality that suffers from none of the defects found in commonly available correct image amici diagonals. The finest 7-Layer Multi-Coatings ensure the image is bright and contrasty, and the oversized prism provides the full clear aperture of 1.25"! The precision machined aluminum housing provides a stress free mounting and precise location for the prism, unlike the typical weak plastic or crudely cast and machined housings found on lesser diagonals. The end result is a correct image diagonal that is good enough for more than just high-quality terrestrial viewing. Correct image diagonals have been used traditionally for terrestrial viewing, and limited to low (under 100x) magnifications. The high quality of Baader's diagonal lets you use much higher magnifications without aberrations or image breakdown for both astronomical and terrestrial uses. The diagonal is perfect for matching astronomical charts or sketching correctly oriented planetary detail. It also functions well with the Baader Maxbright BinoViewer and Baader/Zeiss Mark V BinoViewer, to provide correctly oriented binoviewing. Many users have commented on how wonderful it is to enjoy correct-image views of all planetary and deep sky objects, and that they would not go back to traditional star diagonals. Finally, views that match star and lunar charts! The Baader Amici prism is well constructed and optically excellent with very good contrast and very low scatter. I use it with a small grab and go setup. The diffraction spike which is unavoidable with this type of diagonal is definitely minimal.